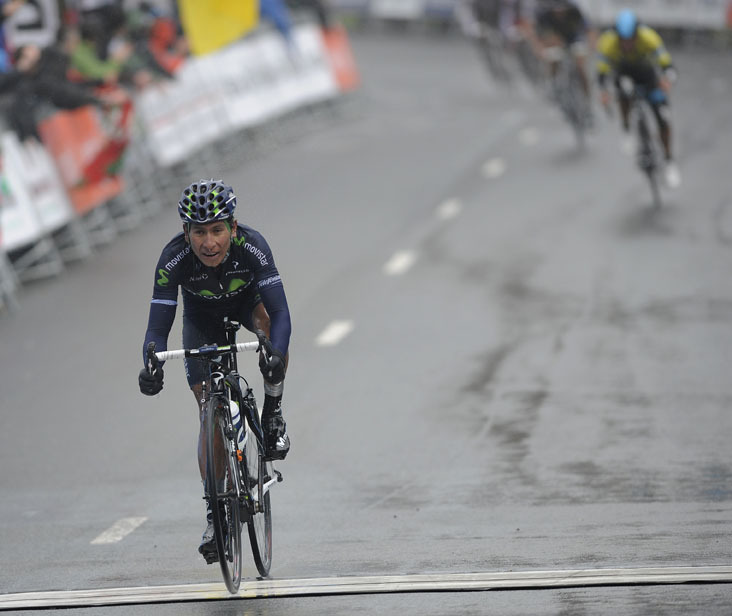 Nairo Quintana (Movistar) put in a late attack from a small group of contenders on the day’s final climb to win stage four of the Tour of the Basque Country on Thursday. Overnight leader Sergio Henao (Sky) placed second at two seconds to retain his leader’s jersey, with Alberto Contador (Saxo-Tinkoff) in third. Henao leads Quintana by just six seconds in the overall classification. Henao’s Sky team-mate Richie Porte is third at 10 seconds. Earlier, Daniele Ratto (Cannondale), Peter Velits (Omega Pharma-QuickStep) and Matteo Montaguti (Ag2r) had hit the final rain-lashed ascent at the end of the race’s ‘queen’ stage with a slim lead over the chasing peloton. Ratto then fell back, leaving Velits and Montaguti clear up front. Behind, the pace was upped as Movistar hit the front of the bunch. Simon Spilak (Katusha) attacked and swiftly bridged up to the tiring Velits and Montaguti, passing them with ease. Carlos Betancur (Ag2r) saw his opportunity to try and catch Spilak, perhaps in an attempt to make amends for the previous day’s close second-place behind Henao. Porte reacted quickly to Betancur’s move, followed by Contador, Quintana and Henao. Spilak was caught within the final 3km by the elite chase group, as Porte continued to set a steady pace towards the finish. Within the final few hundred metres, Quintana launched a big attack, quickly distancing the rest of the group to take the stage. Jean-Christophe Peraud (Ag2r) and later Andrew Talansky (Garmin-Sharp) both crashed after the finish line on slick roads. Peraud nearly took out the entire ensemble of photographers. The climbing continues tomorrow (Friday) with a stage featuring ten categorised climbs from Eibar to Beasain over 166 kilometres. The race concludes with a decisive 24-kilometre time trial on Saturday (April 6) in Beasain. If strong time triallist Porte can stay within striking distance of the lead on Friday, he’s a sure bet for the overall win to add to his Paris-Nice title.